• Translucent and sticky makes working with these templates less tricky! Audition the embroidery before ever making a stitch! Periodically, there's a product that is as great as the invention of sliced bread. Sure, anyone can slice their own loaf of bread, but it sure is more convenient when the bread is already sliced for you! That's how we feel about the new Print & Stick Target Paper! Translucent and sticky makes working with these templates less tricky! 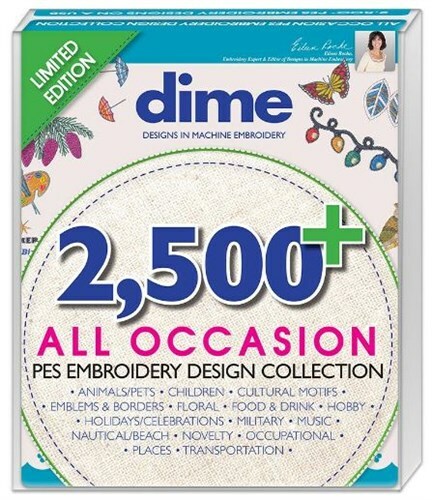 As an embroiderer, you're accustomed to working with traditional paper templates. 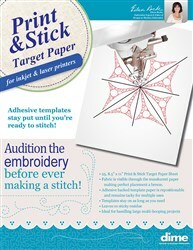 You print a template of your embroidery design on plain copy paper. Sure, it will help as you position and plan your embroidery layout. But the paper can slide—the scotch tape you use to attach the template to your project wears out and the template is a little awkward to work with. Or you may be more advanced and use tracing paper for your templates. But it's a little tricky to run tracing paper through a printer or copy machine. It's also very delicate to work with and it's not adhesive backed! But when you use the new Print & Stick Target Paper you'll immediately see the difference! It's translucent! This means you can see your fabric and embroidery through the template. What a difference this can make when you're trying to align your embroidery design layout! You can see the embroidery stitches through the template! Continuous embroidery has never been this easy! It's adhesive! Having the ability to adhere the entire template on your project helps ensure accuracy! I've used scotch tape in the past, but one way or another, the template shifts and my carefully planned embroidery layout is ruined! Print & Stick Target Paper is adhesive backed and lasts for multiple uses! Adhesive templates stay put until you're ready to stitch!